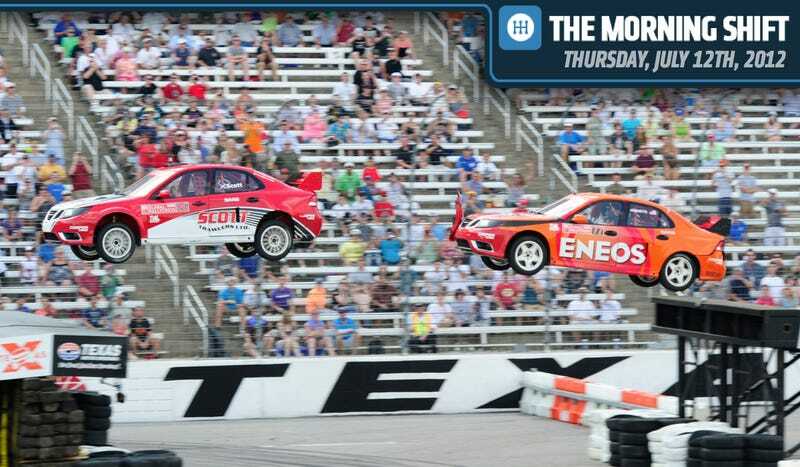 Global RallyCross has produced some interesting races this year, but more notably it's created serious injuries to multiple drivers. One of the big culprits has been the ramps they've put in the middle of the courses. This image shows a new and improved ramp with a flexible barrier of some sort instead of a hard one. It's an improvement, but it's not clear if it'll be able to support multiple crashes (should they happen). Is this just stupidity? We know someone who thinks so. What do you think about the jumps? Exciting or unnecessary and dangerous? Volvo has come up with a new system aimed at keeping drivers from running into wild animals. The road kill avoidance system (our term, not theirs) alerts the driver and automatically brakes to avoid animals on the road. It expects to roll it out over the next several years. The system has two parts: a radar sensor and an infra-red camera, and works in daylight and at night. The camera monitors the road ahead, and if it spots an animal in the road, it sets off a signal. If the driver ignores it, the brakes are automatically applied. In its first stage, the system will identify bigger animals, such as moose, deer and reindeer. No word about drunken college students. The problem is significant in Sweden, where 40,000 accidents involving wild animals are reported each year. And if you've ever driven from Detroit to Chicago in mating season, you know what a gruesome road kill count you pass along the way. In more technology news, Motor Trend writes about a host of new connectivity features that will probably send more drivers complaining to J.D. Power. Ahem. The next generation of BMW's ConnectedDrive suite includes a navigation system with 3D graphics, a touch pad integration for iDrive, voice-to-text capability, and an available 4G hotspot. The touch pad system sounds a little like what Audi is introducing, but we can't mock the hotspot after losing power in Michigan last week. Here's how Motor Trend describes the 3D graphics: "When you begin closing in on the next nav point, the perspective will shift from the normal bird's-eye view to a more detailed 3D overhead view, showing the traffic situation and giving you a better idea of what's ahead. If your city's 3D map data is stored in the system's database, the new viewing option "3D City Models" will show a representation of the surrounding streets and buildings to help drivers navigate the often-confusing urban landscape." How did anyone get around without it? Bloomberg reports Renault is giving up on its 2012 sales target because of weakness in the European auto market. It had hoped for a three to four percent increase in company sales, but scrapped that because declines in Europe will offset gains elsewhere. And, Peugeot announced this morning that as expected, it will close a French factory, and cut an additional 8,000 jobs on top of 6,000 cuts already announced. ACEA, the European trade group, is forecasting sales of 12.2 million this year, which would be the lowest in Europe since 1995, and down 21 percent from 2007. Meanwhile, France's prime minister says there has to be "strong and swift" action to help the country's auto industry. Okay, here we go. Now that Renault is giving up on its sales target, that other European car companies won't be far behind. (Remember we've gotten an international profit warning from Ford already.) Notice that Renault isn't wasting any time in issuing this sales warning. It's only July, after all, and Renault will have some new models coming out later in the year. That usually means things are probably looking worse internally than anyone really wants to let on. Fortune Magazine ruined Chevrolet's day by naming the 2013 Malibu Eco the "most disliked car of the year (so far). It says reviewers have been treading lightly because the Malibu is so important to GM globally, but if you read between the lines, they think the car is a flop. The biggest complaint is that the Eco's 25 mpg fuel economy just isn't good enough. According to Fortune, several prominent reviewers "have concluded that the car compares poorly to other midsize cars in its segment — not to mention another, less expensive Chevrolets — and that, once again, GM has taken a wrong turn in its electric propulsion strategy." Will Eco turn out to be the Pontiac Aztek of the '10s, or is Fortune reading too much into this? The Asahi Shinbun has a fascinating story on the rise of the Kyushu region in the Japanese auto industry. The Asahi says it's on the way to becoming the "Japanese Detroit." For those of you who've never heard of Kyushu, draw a line across from Tokyo to Hiroshima, and then jog south. In fact, you can compare the rise of Kyushu to the rise of the American South. Both are places where carmakers built new plants, and have instituted new work practices that have been streamlined compared with the way they run their traditional plants. Kyushu is a strong hold for Toyota's Lexus production, and it also is about to account for half of Nissan's Japanese production. To get a handle on how important it is: in 2001, only 7 percent of Japanese vehicles were built in Kyushu. Last year, 14 percent were made there. I'm not surprised to hear that Kyushu is growing so fast. I took a trip there a few years ago, flying from Tokyo to the biggest nearby city, Fukuoka. The plane was a Boeing 747, and it was packed with businessmen. I sat up front in business class, and as we got up to leave, I paused at the exit door to let a gentleman go ahead of me. One after another, everyone else followed him, with nobody saying, "after you" to me. I told my host about this later, and he laughed. "That's Kyushu Man," he said. I was puzzled and he grasped for an explanation. "Do you know John Wayne?" he asked. Today, we'd love your views on what Volvo is doing. Should car companies proactively install systems in their cars to protect drivers? Or, is the answer better education and stricter safety laws? Have you ever wished your car spotted an obstacle and warned you about it? Remember, there's no right answer or wrong answer. it's Neutral.